Rather than sitting on your bum for Spring Break, what would you say to a vacation where you can eat healthy and stay active? We have some suggestions for doing just this on beautiful Chincoteague Island, Virginia. First, sign up for the Bay-to-Bay 10k run (or 5k walk) to be held March 30th at 8am at the Robert Reed park in Downtown Chincoteague. 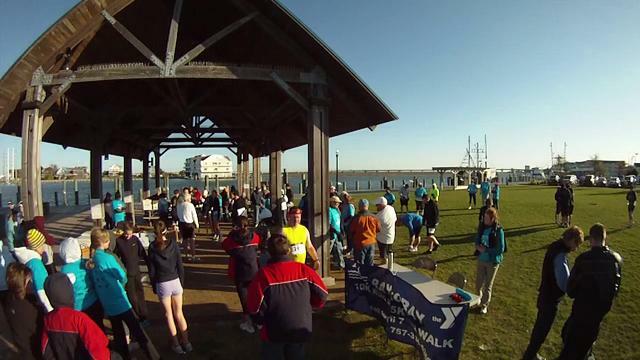 See all the sights of downtown and waterfront Chincoteague as you walk or run the course. Entrance fees: Adults $35, Children $10. All proceeds benefit the Chincoteague Family YMCA. For more details visit www.ymcachesapeake.org/chincoteague/programs/healthy-living/bay-to-bay-5k-walk/10k-run/, email aswiger@ymcachesapeake.org, or call 757-336-6266. If cycling is more your speed, you’re in luck! Bring your own bicycle and lock it up in our bike racks, or rent one of ours and cruise the many miles of bicycle-friendly roads and trails on Chincoteague and Assateague. A favorite “easy ride” (or walk) for our guests is the wildlife loop at Chincoteague National Wildlife refuge, which is closed to cars until 3pm–that means just hikers and bikers! World-class wildfowl and wildlife watching can be found here year-round, so your ride will be both interesting and productive. The trail is completely flat, so it’s a good choice for those starting a fitness plan or looking to work off some of those Island Creamery calories. Most of the roads on Chincoteague are equipped with either large shoulders or sidewalks to accomodate pedestrians. Traffic moves at a leisurely 25mph, so walking is much safer than in most vacation destinations. 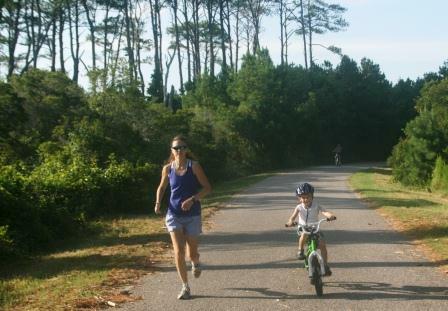 There are also two shaded walking paths on Chincoteague Island, as well as a few on Assateague. We recommend sunscreen and bugspray whenever you’re planning on going outside, just incase. Mosquitoes aren’t typically bad before Memorial Day or after Labor Day, but there are always exceptions. The best time to see the island is during the Spring, when new foals arrive, and in the fall, when the majority of wildfowl migrate through the area. Mosquitoes aren’t as bloodthirsty, either. It is also typically cooler in these months than in summer–which everyone knows makes a good workout great. In the event of bad weather, you can still get in a good (if a bit boring) workout in our fitness room. Chincoteague Oysters are a delicacy enjoyed world-wide; however, nowhere else can you eat them fresh out of the water! Another important aspect of health is diet. It is universally acknowledged that fresh seafood is an excellent low-fat source of protein. Chincoteague is the self-proclaimed oyster capital of the world, as our unique salt oysters are fresh and plentiful here year-round. Fishing boats dock downtown daily with a variety of fresh fish, much of which ends up on a restaurant table the same day they’re caught. For those who aren’t fans of seafood, check out local take-out cafe Sea Star, with numerous vegan and vegetarian options. They usually have a line to order, but everyone agrees it’s well worth it. We look forward to seeing you (and your running shoes) soon! Book soon for this Spring– weekends are filling up quickly!